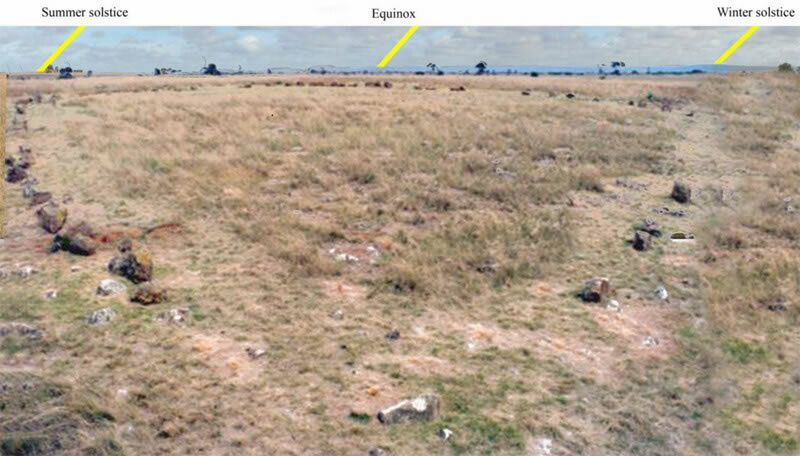 A research paper testing the solar alignments of Wurdi Youang has been been published in the May 2013 issue of the journal 'Rock Art Research', Volume 30, Issue 1, pp. 55-65. A preprint (PDF) can be viewed here. About halfway between Melbourne and Geelong in Victoria lies a large egg-shaped arrangement of ~100 basalt stones, each between 0.5-1 m in height. The arrangement is 50 m wide along its major axis, which lies almost exactly east-west. Traditional Ownership of the site, as registered with the Victoria Aboriginal Heritage Council, lies with the Wathaurung Aboriginal Corporation. Figure 1: The Wurdi Youang Aboriginal stone arrangement in Victoria. At the western apex (at the top of Figure 1) are three stones that appear to mimic three mountains in the background. 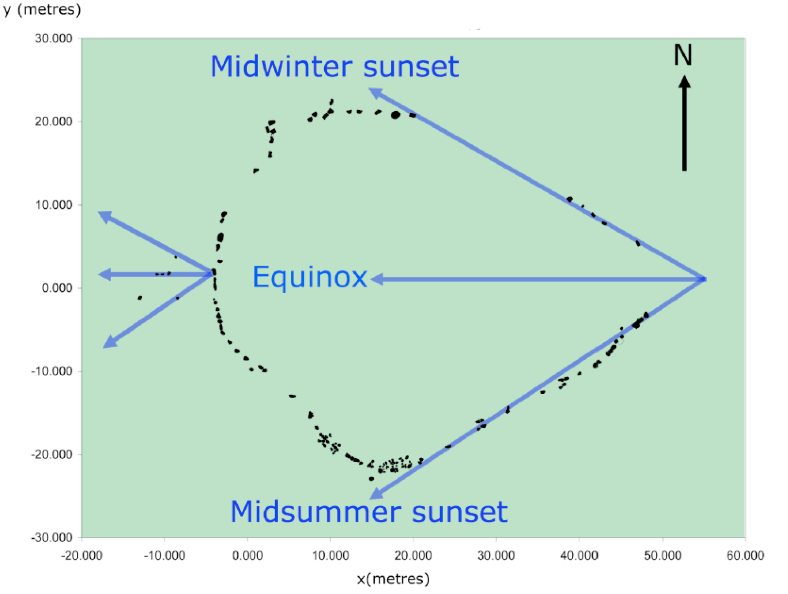 The late historian John Morieson suggested, in the 1990s, that a few outlier stones on the western end of the arrangement indicated the setting sun at equinox and summer and winter solstice (Figure 2). Ray Norris and his wife, Cilla, conducted a detailed survey of the site in 2008. Ray visited the site again with me in 2009. The results of the survey show that the outlier stones do indeed align to these solar points, but also that the straight edges of the arrangement also indicate these alignments (Figures 3 & 4). This provides us with two lines of evidence that these stones align to solar points. 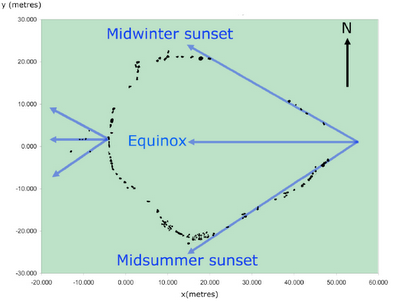 equinox, as noted by John Morieson. The Wathaurong people have inhabited the area for over 25,000 years (Figure 5). Unfortunately, the traditional language, customs, and ceremonies were banned by missionaries over 100 years ago. As a result, only fragments of information survive today, and Wathaurong elders are uncertain what the stone arrangement means or what it was used for. Because of this, we do not know the age of the arrangement. The land on which the arrangement is situated has been maintained by the same family since early colonial times, ruling out a European origin. Therefore, it could date to anywhere between 25,000 years to ~1835. We are exploring methods of dating the arrangement, closely collaborating with the Traditional Elders. Figure 5: The geographic area of the Wathaurong nation, west of Melbourne. The primary purpose of this arrangement may not be astronomical, but we do know that the arrangement of these stones does mark the sun at solstice and equinox. At this point, we are simply testing the astronomical hypothesis, but much more research must be done in order to ascertain its original purpose and intent, something we may never know for certain. We do not reveal the exact location of the site, respecting the wishes of the elders and to keep the site from high levels of public traffic, which can severely damage the site in a short amount of time. Listen to a short broadcast about Wurdi Youang on ABCs "The Science Show" featuring Duane Hamacher and Ray Norris, narrated by Robert Cockburn. Hosted by Robyn Williams. We would like to thank Wathaurong cultural officers Reg Abrahams and Trevor Edwards for their assistance. We acknowledge the Wathaurong people, both past and present. Whohoo! I knew the Watharong were smart people. :) Inventors of stone huts, canals and now Astronomy! I only just found out about this while doing some moon research. I'm an Australian pagan/witch and had not heard of it before! I LOVE that it's whereabouts are NOT made known and so hopefully will remain undamaged long into the future. Thank you must go to all the researchers and elders involved in learning more about it, it's very exciting to read about! ~can't wait to hear any new information you may discover! Romana S: its not just the wathaurong language group that worked with the stars. i agree smart mob, but all Indigenous peoples across australia working with the stars, plenty of stories which relate to the stars. lots non-Indigenous can learn from indigenous about our place where we live. look forward to the publishing of your work with collaboration with wathaurong community. It's difficult to find much written about Indigenous Australian astronomy etc, so I was glad to come across this site. Many non-Indigenous would love to learn about it from you. Anyone teaching? I love this blog! I had no idea that anything like this existed in Australia, and it just goes to further illustrate the true harmony in which the real owners of this land lived with their surroundings. Many Thanks for creating this wonderful repository of knowledge, and for sharing the information responsibly! Looking at the arrangement in the pictures and on goggle earth, is it possible there was ever a matching one facing East, to line up the sunrise locations as well? On the satellite images it appears the area to the east has been ploughed or otherwise distrubed, but just wondered has anyone checked? The other interesting thing about this is that whilst something like stonehenge was aligned to the sunrise and sunset positions as they were say 3000+ years ago, this circle would have been maybe constantly updated (i.e. the stones moved) until 1835 when usage was discontinued. Maybe? Eta Carinae, Comets, and Cosmic Impacts!